When you bake a bread at home and it turns out nice, it is a very satisfying feeling. Though it takes a lot of arm muscles to knead the dough for nearly 10 -15 minutes, I just feel so glad and happy when the bread is baked. Yes, I do need to invest in a dough kneading machine, but till then arm muscles will have to do. When you knead the dough, do not make the mistake of trying to pull the dough and tearing it. This will break up the gluten structure and the bread will not have a nice soft texture. Knead the dough with the heel of your hand, turn a quarter circle, knead and fold, so on and so forth. When I first started baking breads, I tried out rolls initially before I ventured into baking loaves.If you do have a dough kneader the task becomes easier. 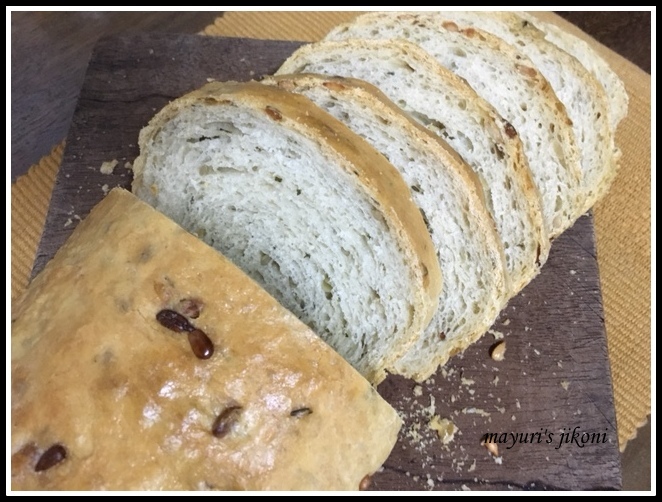 This bread reminded me of the famous Warburton seeded loaf which, I have ever so often when I am in UK. They add a variety of seeds which you can. I just had sunflower seeds. If you are not using instant yeast, then add sugar to the warm water. Add the yeast. Mix. Cover and let the yeast become frothy. This may take 5 to 10 minutes. Sieve the flour. Add salt, rosemary and 2 tbsps of oil. Mix well. Using the yeast mixture form a dough. It may be pretty sticky to handle. Turn it out onto a floured board and knead for 10 – 15 minutes till it becomes smooth and silky. Form the dough into a nice round ball. Grease a big bowl with oil. Put the dough into it. Smear the dough with a bit of oil. Cover with a cling film or plastic and let the dough rise till its double the size. This usually takes about 2 hours in a warm kitchen. I usually put th dough into the oven or an airing cupboard. Once the dough has risen, gently punch it down with your knuckles. Roll the dough into a rough rectangle. Roll it up like a swiss roll. Tuck the ends underneath. Grease a loaf tin 9X5 inches or of a similar size. Place the dough into the tin. Brush the top of the loaf with the remaining oil. Let the dough rise again, about nearly an inch over the rim. I usually put this in the oven. Or you may cover it with a dome shaped cover or a big bowl. This will take about 45 to 60 minutes. Preheat the oven ( remember to remove the dough) to 200°C. Place the loaf tin in the oven and bake at 200°C for 10 minutes. Then lower the temperature to 180°C and bake further for 20 minutes or until the crust is golden brown. Remove the bread from the tin and let it cool on a wire rack. KNEADING TECHNIQUE : Dust a large board or work top with flour. Put the dough onto it. Using the heel of you palm, knead the dough, turn the kneaded part back, and continue, kneading in the same manner till you get a soft smooth dough. Pretend the dough is divided into 4 parts and knead each part in turn. Do not stretch or pull the dough as you will break up the gluten and the dough will not prove or rise properly. Knock the top and bottom of the loaf. If it sounds hollow then the bread is done. If not return it to the oven. Shape the dough into a round ball and bake or into individual rolls. Can brush the top with an egg wash instead of oil for a better crust. EGG WASH is about 2 tbsps of liquid either milk or water mixed with an egg. Sprinkle seeds, sesame seeds,poppy seeds on top before baking. It is difficult to find strong plain flour in India. Add 2 tbsps of gluten to every 500g of flour.